We launched new websites for Dakota Digital and Flaming River (as well as a couple others) this month and I'm really excited. You can click on the images above to visit their new sites (and ours). They're both eTechGlobal sites. 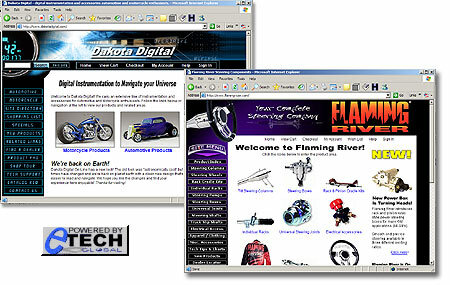 eTechGlobal is a company that was started back in 2002 with a good friend of mine in Denver, to compliment Scooter Designs, a web development and consulting firm that I established back in 1994. The idea for the new business venture happened when I saw a job opening for a full-time web developer at Gateway Computers. It made me fantasize about how much easier my job would be if I only had one set of code to enhance and perfect. Then I thought, what if we developed a site with infinite features that could be turned on or off, depending on the client's needs? From this idea, eTechGlobal was born. My business partner Don, is a world-class programmer and D.B.A. with Midwestern work ethics, so we make a great team. The beauty of the eTechGlobal system is that it uses a shared code base for every site however each website resides at a unique domain and has it's own custom look, images and data. This means that if client "A" requests a new feature, it will be available to client "B" after it's been added and vice-versa. The application keeps getting bigger and better with each new feature and update so every client benefits in the process. Best of all (as far as I'm concerned) we have one set of code to build on and perfect - and our clients always have the latest version.